I confess that at times I buy fabric without any idea what I am going to sew with it. There are usually two reasons for this. 1. It's on sale. 2. It might sell out and I might miss out on it (usually related to reason 1). And sometimes 3. A false sense of urgency to buy has been created and even though I know this is happening I still fall for it and buy. I don't think I am alone here. So if I am not alone that must mean that perhaps you, or a quilter friend of yours, do this too and then find yourselves with fabric sitting around in your stash and you wish you knew what to sew with it. Have no fear because today I am here to help with a solution. Here is what you need for this project: 48 charms and 1 yard of coordinating background fabric. (My charm pack came with 40 charms so I picked 8 extras out of my charm square collection. You could also cut 8 charms from coordinating scraps.) This will make 12 blocks that are 10 inches finished. A perfect size for a crib quilt. Or, add borders with more yardage for a lap quilt (which is what I will probably do). If you have two charm packs and two yards of background fabric then you have enough for 24 blocks. My fabric for this project. The impulsively purchased charm pack. For the background I had bought a half meter in the summer and then, forgetting that I had it, I bought another half meter in November. I was thinking I would use it with the Cotton and Steel Christmas fabrics but when it came I realized it doesn't really match with those fabrics. Luckily, it matches with the Cotton and Steel Mesa line. Start by cutting 48 charm squares (5 inch squares) from your yardage. Cut your yard into six 5 inch strips. You should be able to get 8 background squares per strip. Place each charm right sides together with a background square. Sew each pair together around the entire perimeter of the square with a quarter inch seam as in the diagram below. Then make two diagonal cuts across the square to yield four triangles which when opened are HSTs (Half Square Triangles) forming a square. This trick for making four HSTs at a time has been around in the quilting world for a while now. I'm not sure who first thought of it but it wasn't me. Place one charm right sides together with a background square and sew a quarter inch seam around the entire perimeter. 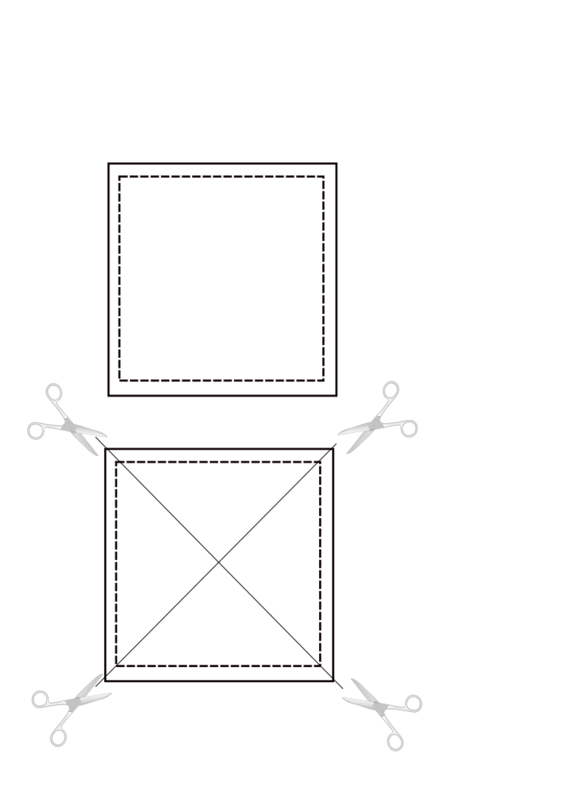 Make two diagonal cuts with your rotary cutter and ruler across the square to make four triangles. Open your HSTs and press seams open. I recommend pressing seams open on these HSTs because it will reduce bulk when we put our squares together. We are going to have 8 fabrics coming together at the seams. Now it is time to trim up your squares to 3 inches square. I'm not going to lie... this step is time consuming and tedious but it's worth it for the accuracy you achieve in your finished blocks. Make your first two cuts and then rotate your mat if you have a rotating mat. Or, if not, then turn your block on the mat. Line up the 3 inch lines with the two sides you just cut and your 45 degree line on the seam. Make your next two cuts to trim up the last two sides. This may not look like I trimmed off a lot of fabric but these little bits add up to a significant amount across a whole block and even more across a whole quilt top. I recommend breaking up your trimming into a few shorter sessions rather than trying to do it all at once. Maybe trim enough for two blocks. Sew those and then trim some more. Or sew two blocks a day. In less than a week you'll be ready to put your top together. Lay out 16 HSTs in four rows of four. This is the layout I chose but if this is not for you feel free to spin your HSTs around until you find a block layout you prefer. In this block all the charm prints face inward in the four quadrants of the block except for the four outermost corners. They face out and will form diamonds when all the blocks are sewn together into a quilt top. Sew your HSTs into four rows and press seams open. Then join your four rows to make the block again pressing seams open. When sewing your blocks remember that because we cut across our squares on a diagonal we created bias edges which are stretchy so be mindful not to stretch your fabrics too much while sewing. So there you have it! A simple charm pack will turn into an amazing quilt top. I will update this post when my quilt is finished. Keep following Daydreams of Quilts in 2016 as I write more tutorials and patterns that will help you and I work with what we have to make valuable quilts from our stash.